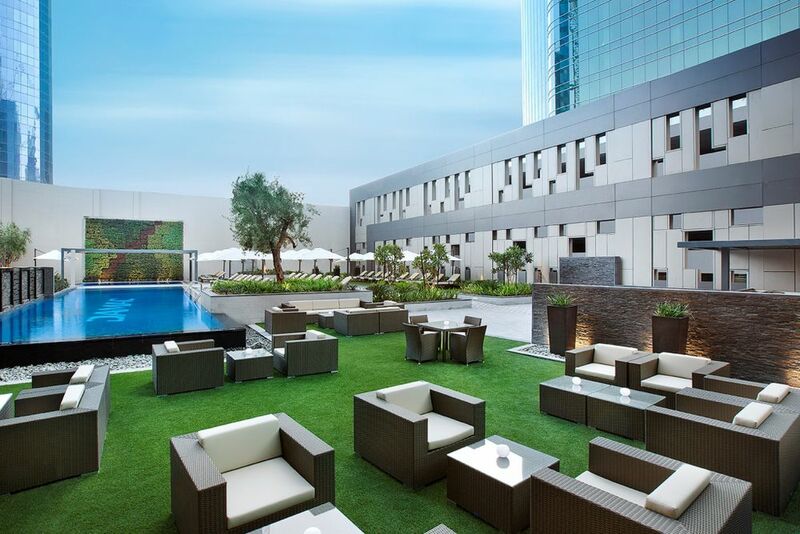 DAMAC Maison Cour Jardin Dubai is an urban garden of contemporary luxury, right at the heart of Dubai's Downtown Business Bay area. 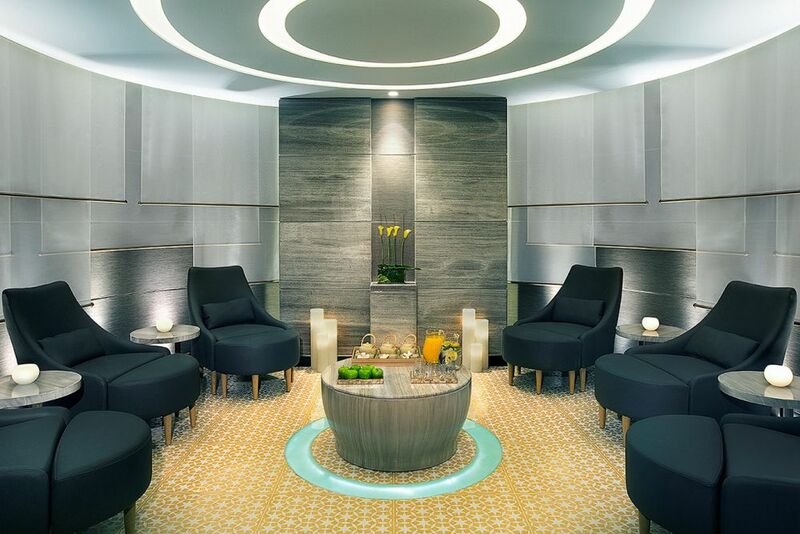 Whether in Dubai for business or pleasure, we invite you to retreat to a place where ultimate luxury and opulent design set the stage for an unforgettable experience. 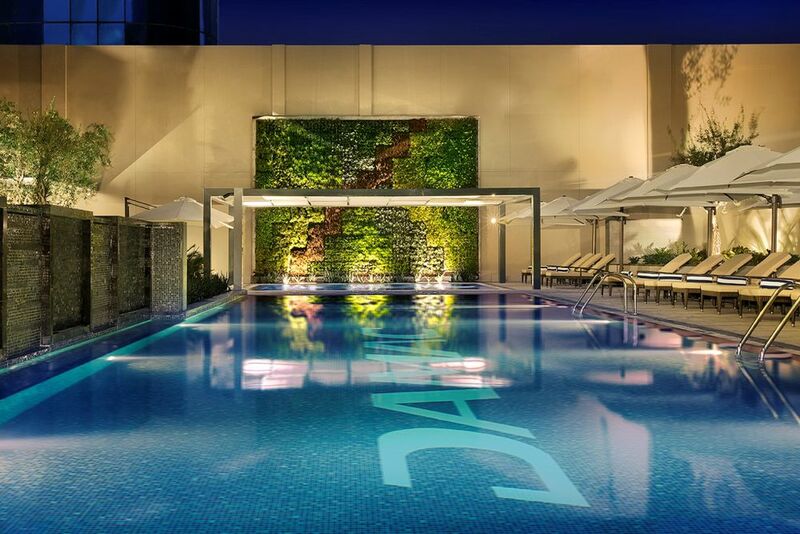 There's no place like DAMAC Maison. 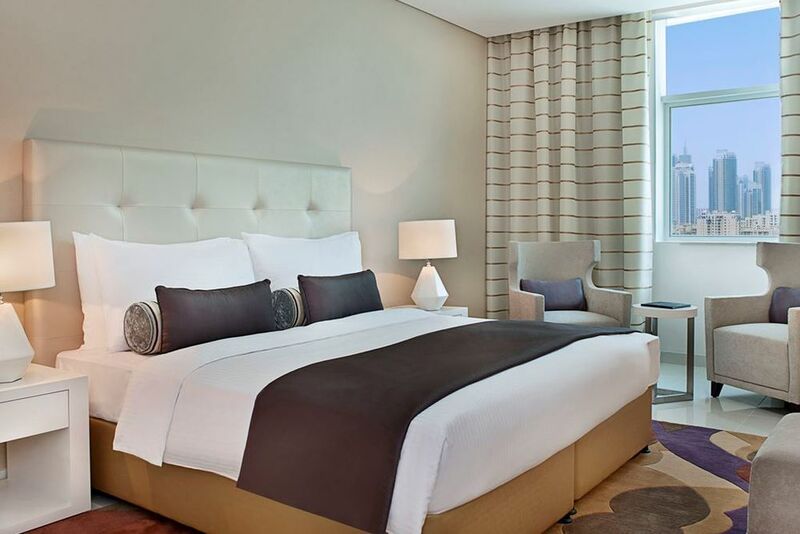 The luxury hotel’s ideal location is in the business district of Dubai, allowing you to reach the beautiful sights of the city in just a short time. Even the world-famous Dubai Mall is only 15 minutes away from the hotel. 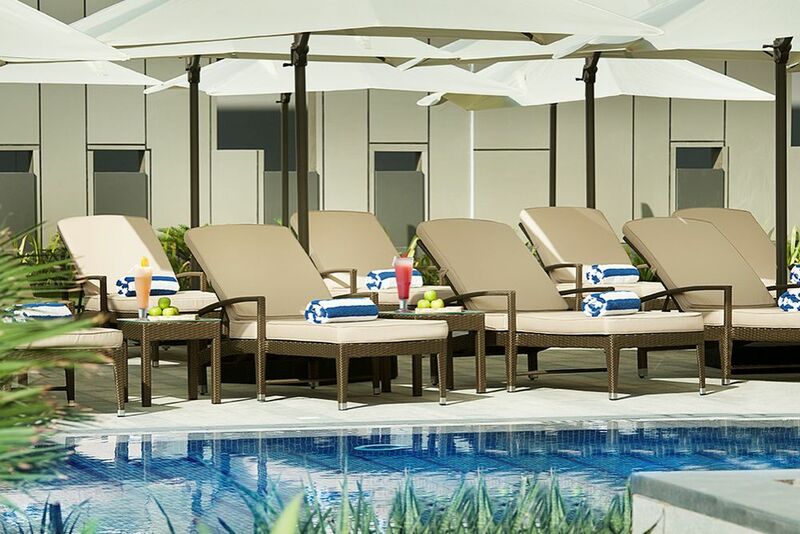 Cour Jardin provides the perfect blend of business, leisure and entertainment. 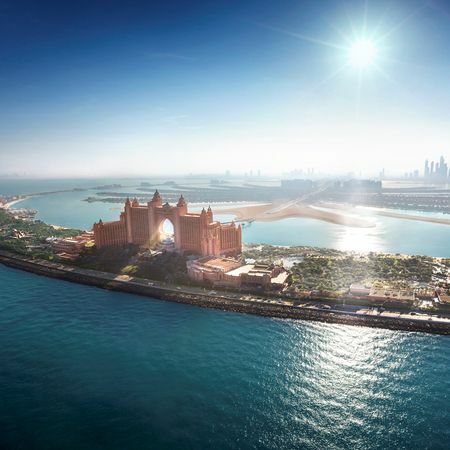 The luxurious hotel also offers complimentary shuttle bus services to Dubai’s key attractions. Dubai Airport is approximately 14 kilometers away. 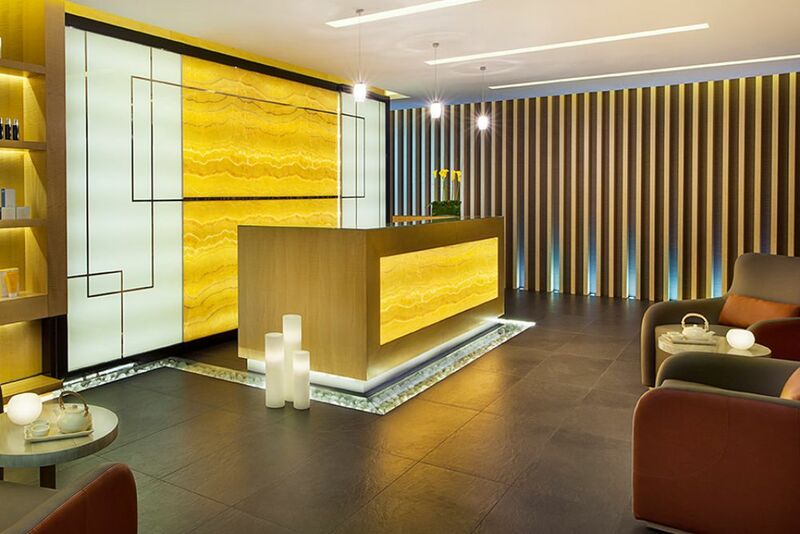 The experienced staff at DAMAC Maison Cour Jardin cater to the needs of guests by providing an extensive range of services and facilities. 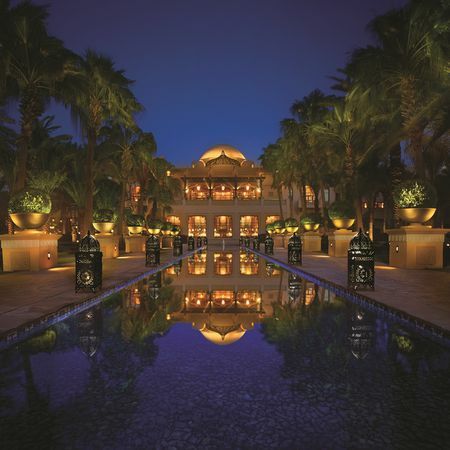 From delicious Middle Eastern cuisines with touches of European blends, to a kid’s club where you can leave your little ones safe in the hotel’s care- the luxury hotel has thought about everything you could possibly need. 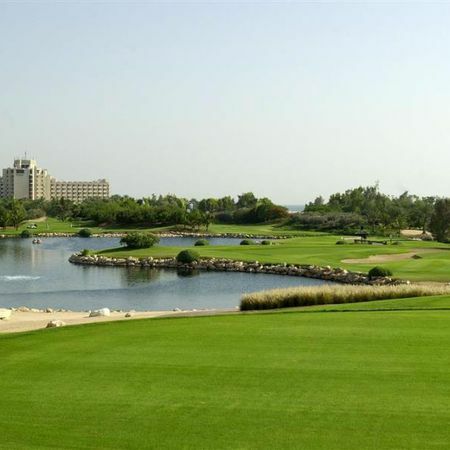 At Zaitouna Bay, savor the best of cuisines and culinary delights in an exquisite dining venue. Offering a relaxed ambience and exceptional service, this restaurant is suitable for any occasion. The menu offers Eastern cuisines with touches of European blends. 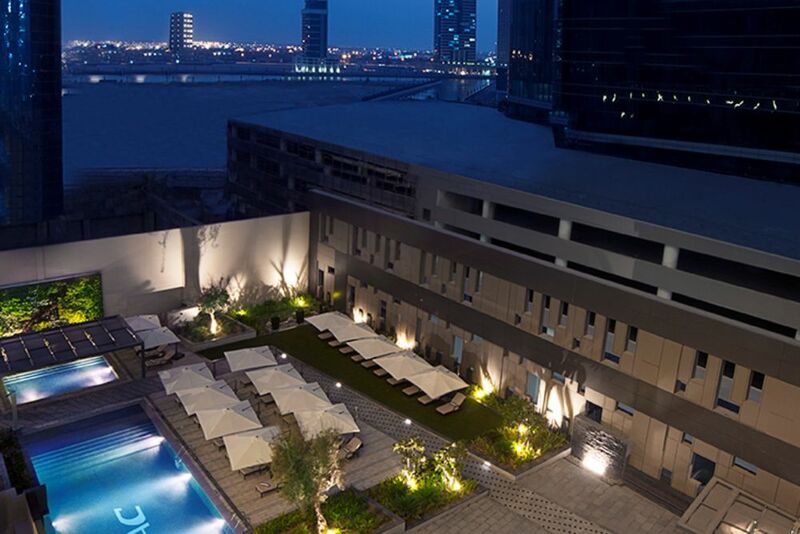 Guests can also try an array of flavored shisha’s by the outdoor swimming pool overlooking the stunning Dubai skyline. 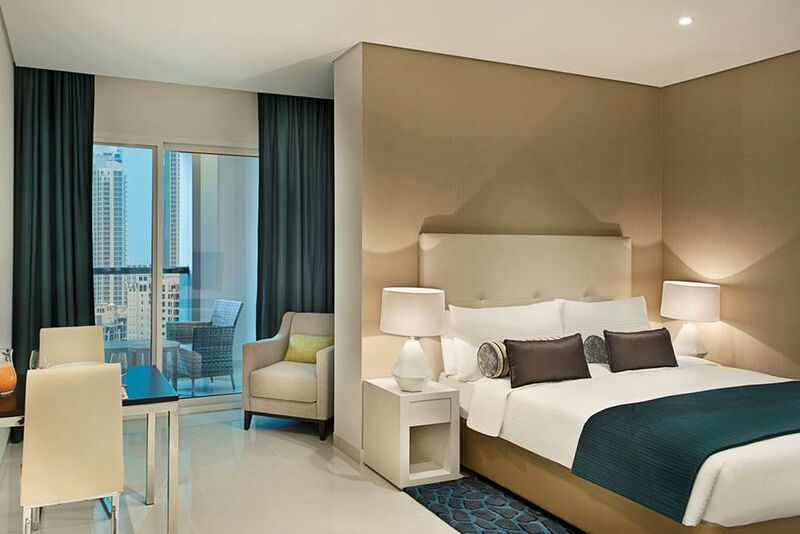 Crafted for total tranquility, the luxurious guest rooms and suites provide a private Dubai accommodation where lavish furnishings, state-of-the-art entertainment systems, world-class amenities, stellar service and stunning views of Dubai entice you to relax and unwind. Amenities include air-conditioning, a seating area, coffee/tea making facilities, Wi-Fi, spacious bathrooms and an LCD TV. Deluxe Room (42 sqm) - Elegantly set up, these rooms are comfortable, well-lit rooms with the exact amount of space that you need. One Bedroom Suite (67-87 sqm)- With a separate living and sleeping area, these suites have Elmis toiletries in the luxurious bathroom, a desk, a dining area and a kitchen. They overlook the hotel courtyard or the Dubai skyline. 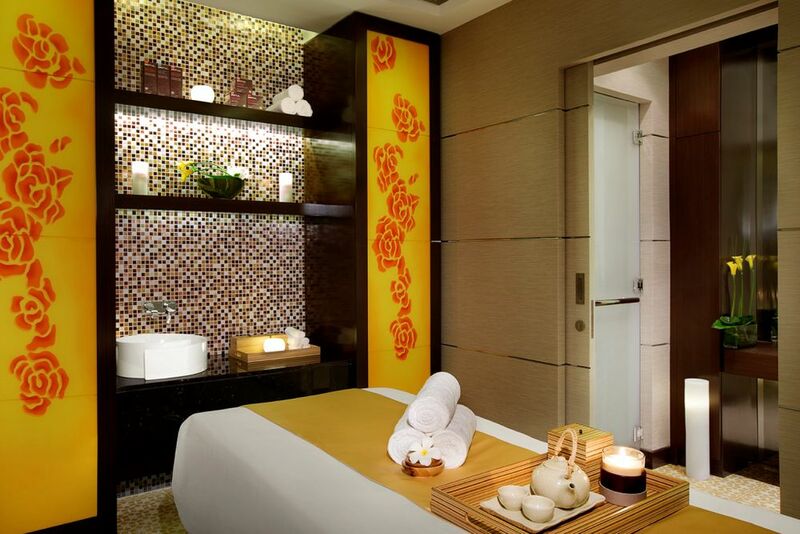 Dreamworks Spa is a place of ultimate relaxation boasting seven treatment rooms, holistic cocooning room, a flotation tank, steam and sauna rooms and a Jacuzzi. 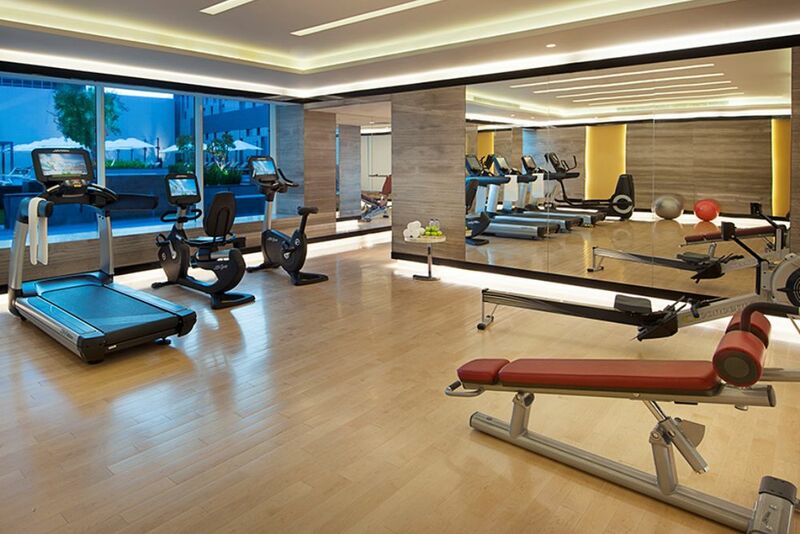 They also have a beauty salon and a fitness center with stunning views. 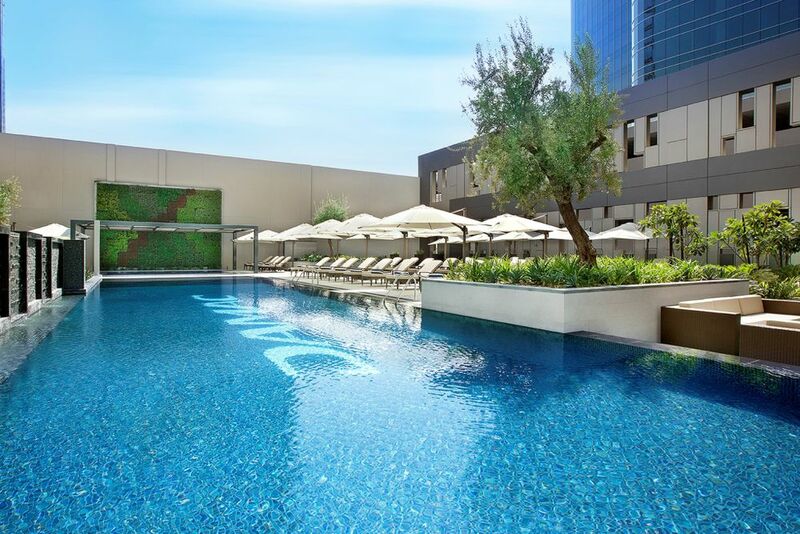 The beautiful infinity pool overlooks the Burj Khalifa, providing refreshing dips on hot days.